I've got to go home. My wife's making gardenias for dinner. 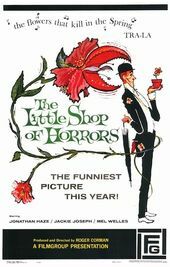 Originally produced under the working title The Passionate People Eater, Roger Corman's The Little Shop of Horrors was every bit as camp as its ’86 singalong remake. 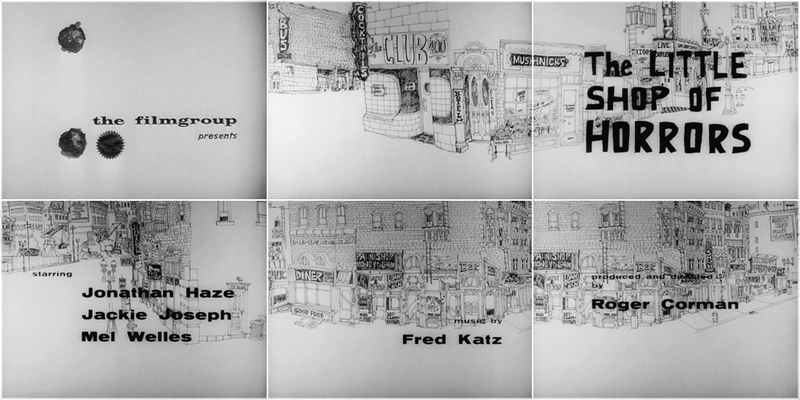 The title sequence to the original film (above), features an impossibly long illustrated panorama of Los Angeles’ downtown Skid Row, establishing the character of its featured neighborhood. The production logo at its mast bears a striking resemblance to another much more famous sticker-dot title design years later: Maurice Binder’s Dr. No. While horror remained a popular B-genre throughout the ’60s, most of the cinematic innovation came from elsewhere, with British suspense and Italian slashers consistently dominating the Hollywood box office. American studios would acquiesce to their influence by importing directors like Roman Polanski (Rosemary’s Baby, 1968) and George Romero (Night of the Living Dead, 1968) towards the end of the decade, but in the meantime there was no shortage of inventive domestic entries. 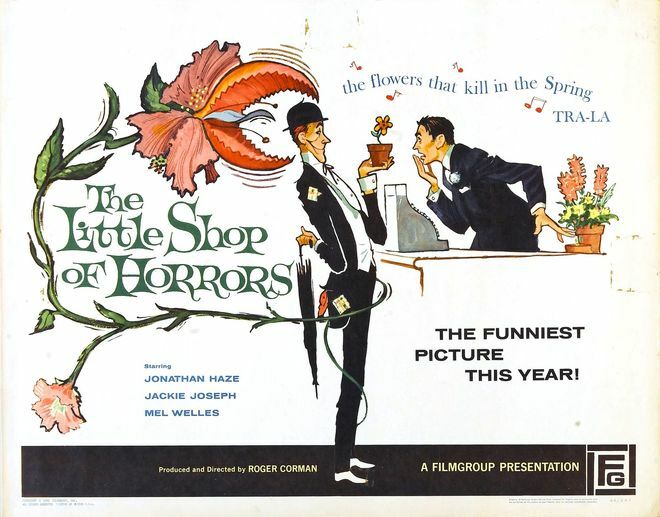 Astonishingly, Roger Corman did not think his comedy horror about a shoddy florist's assistant and his flesh-eating plant would be financially successful, so he decided not to copyright it. Today, The Little Shop of Horrors is in the public domain and widely available. The original trailer for The Little Shop of Horrors (1960) features some great examples of typography from the era.